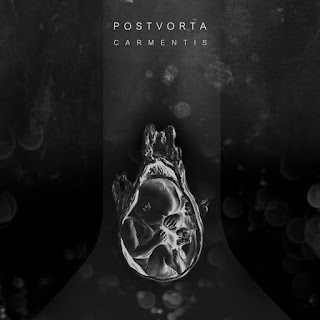 Postvorta are a band from Italy that has been featured before in this zine and plays a mixture of post and sludge metal with a touch of black metal and this is a review of their 2017 album "Carmentis" which was released by Third I Rex. Atmospheric soundscapes start off the album while also adding in touches of ambient and drone and melodic female chants are also used briefly and they give the music more of a shamanistic atmosphere and after the intro clean guitars are added onto the recording and they add in elements of post rock. A great portion of the tracks are very long and epic in length and after awhile drum beats start to make their presence known while you can also hear all of the musical instruments that are present on the recording and once the music gets heavy it brings in the heaviness of sludge and doom metal. Vocals a re mostly angry sludge style screams along with a few growls and as the album progresses a brief use of melodic vocals can be heard while the music also gets very atmospheric at times along with a touch of black metal and all of the songs stick to a very slow musical direction and slide guitars along with stringed instruments are also used briefly. Postvorta creates another recording that remains true to the mixture of sludge and post metal from previous releases, the production sounds very professional while the lyrics cover mythological themes. In my opinion this is another great sounding recording from Postvorta and if you are a fan of sludge and post metal, you should check out this album. RECOMMENDED TRACKS INCLUDE "Colostro" and "Patutu". 8 out of 10.